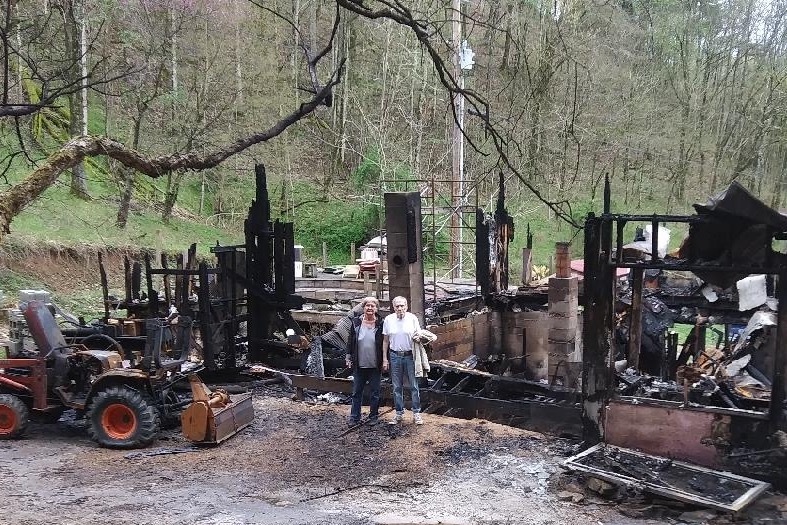 My parents’ home, the house that I grew up in, that they built with their own hands over 40 years ago and planned to spend the rest of their lives in, burned to the ground. It happened suddenly, and while they were fortunate enough to make it out safely, all of their belongings were lost. The fire consumed everything in the house, their nearby tractor and truck, and a significant portion of the woods around the house. Inside the house was Linda's workshop and studio — decades worth of artwork, materials, tools, supplies, and large equipment. It was the way she made her living, and it's all gone. There is no insurance assistance, and, without a studio, no income. We are trying to get their lives back from scratch. First, temporary lodging and basic necessities like clothing. Then, a place to live and work. Ultimately, it's going to take a very long time and much more than our stated goal, but this is a start. Thank you for helping Linda & Dave get back on their feet. Any amount helps.